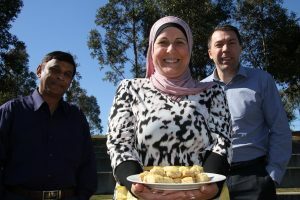 Mayor of Campbelltown George Brticevic, right, with Cr Masood Chowdhury and Monda Dehaini with a plate of Lebanese baklava. She’ll be doing a Middle Eastern cooking demonstration at multicultural celebration Feast Campbelltown on September 22. In the blink of an eye, Campbelltown has been transformed into a harmonious multicultural community. The change from an essentially British demographic started 20 years ago but has accelerated to the point where almost one in three local residents is overseas born. A demographic comparison between the 2011 and 2016 Census reveals large increases in the portion of Campbelltown’s population which is multicultural. The analysis, provided by demographers .id to Campbelltown Council, shows that between 2011 and 2016 there was a 3.3 percent increase in the number of overseas born residents. The number of Campbelltown residents speaking a non-English language at home is now 30.4 percent, up 5.2 percent since 2011. Dominant birthplaces of the newest arrivals in the past five years are India, New Zealand, Philippines, Bangladesh, Fiji and Samoa, according to the .id report. But what is remarkable about the multicultural transformation of Campbelltown is that it has occurred without any loss in social cohesion. 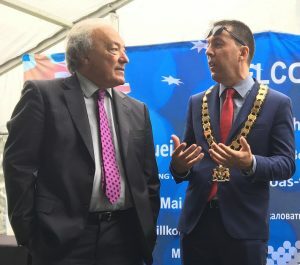 It helps when plenty of community leaders are either migrants to Australia or children of migrants, such as the mayor of Campbelltown, George Brticevic, whose parents came to Australia from Croatia. While high immigration levels, multiculturalism and community discord have been linked by some, this is not the case in Campbelltown. Local leaders such as State MP Greg Warren believe our multicultural transformation has been a positive experience so far. “I acknowledge I have heard some of the concerns about other places, but getting around Campbelltown I don’t see any problems as a result of becoming a more multicultural community,’’ says Greg Warren. 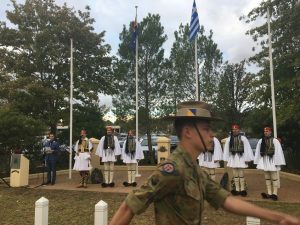 Greek presidential guards taking part in an Anzac Day ceremony in Macarthur this year. “Campbelltown has long welcomed people with warm open arms, as Australia has since World War II and the Vietnam War. Dr Mike Freelander, the federal member for Macarthur, agrees. “I strongly believe that our community is made all the more stronger through multiculturalism,’’ he says. “Indeed, our modern society is one that has been built on migration, and our community has always been a welcome destination for migrants. “While our region is experiencing rapid population growth, we have enjoyed the fruits of multiculturalism for some time. “When I look at my community, I see many cultures living harmoniously together. “Our community is one that is embracing of other people’s cultures, and one which promotes tolerance and acceptance,’’ Dr Freelander said. On Saturday, September 22, a new event called Feast Campbelltown, will celebrate the area’s changing face. To be held in Redfern Park, Minto, it will be a celebration of the food and culture of our diverse community. Dr Freelander and Campbelltown Mayor George Brticevic at an Australia Day ceremony. With food from every corner of the globe, from Greece to Japan and everything in between, Feast Campbelltown is expected to be a big hit and become an annual day. Campbelltown is changing in many other ways, small and big. For example, it is likely to become a badminton mecca because of its large Bangladeshi community, who love the game. One of their own, Councillor Masood Chowdhury, has successfully pushed for the provision of badminton courts in Campbelltown and they should become available soon. Another local federal MP, Anne Stanley, says Werriwa is “a cohesive electorate and the Indian and Bangladeshi contribute a considerable amount to that cohesion’’. “These contributions include, but are certainly not limited to, small business, education and the many cultural festivals in both Campbelltown and Liverpool. I am proud to represent Werriwa for many reasons, one of them being that it is a diverse, cohesive and multicultural community,’’ says Ms Stanley.